Local Businesses in Peterborough and the Kawartha Lake areas looking to embrace green initiatives sweeping Ontario are invited to join SPR Electric with its green initiative. We are ready and have rolled out programs that help local businesses generate clients, and give their businesses a ‘green’ image at the same time. The number of electric vehicle owners in Ontario is rapidly growing and we have joined Sun Country’s goal to put over 1,000 chargers on-line by the year’s end. Announcing our partnership with Sun Country Highway Ltd.
We have partnered with Sun Country Highway Ltd. to roll-out Electric Vehicle Charger Stations across Peterborough, Kawarthas, and the greater GTA. This ‘green’ initiative aims to rapidly accelerate the adoption of electric vehicles and lower carbon emissions in the transportation sector here in Peterborough. The aim being to make available competitively priced advanced technology products to help drive sustainable revenues for local businesses. Sun Country Highway Ltd is a progressive Canadian owned company leading the electric vehicle movement across the nation by raising awareness and promoting the adoption of zero emission transportation. Getting a charger has never been this easy–simply look through this list and make your choice. Each charger is different depending on the voltage and extra gadgets it comes with like touch screen and payment options. If you are not sure which charger to choose, please contact us and lets discuss which may be suitable for you. Once you know which charger you need, simply give us a call at 705.760.3270 or drop an inquiry by clicking HERE. Please NOTE that these prices are only estimates–installation fees are not included. 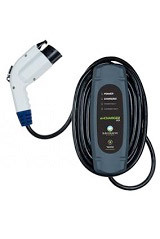 Portable and reliable: The PCS-15 is the ideal level one, 15 amp, 110V solution for Plug-in Hybrids and a convenient backup for Battery Electric Vehicles. Meets cUL and UL listing safety standards. At home charging in a small package: The ideal Level II 208/240V solution for home or public charging. Since the last thing you need is one more item in your garage, we packed close to 5kW of power in this small package. 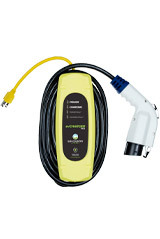 Electric vehicles & commercial fleet vehicles: The CS-40 provides fast charge times--Unit comes with a 22 ft (6.8 m) cord set. *Pedestal sold separately. Advanced electrics & commercial fleet vehicles: The CS-60 provides a faster charge time for the most advanced electric vehicles and commercial fleet vehicles--a great in-between solution. *Pedestal sold separately. 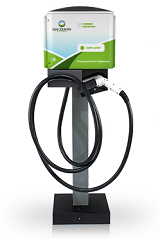 The ultimate EV charging station: Future-proof your EV infrastructure investment with the CS-90 which provides very fast charge times and highest power rating available. *Pedestal sold separately. The "big kahuna" of Level 2 EV charging with the ability to charge Tesla's new Model S in the shortest time. This charger means business. *Pedestal sold separately. CS Charger accessory If you are lacking wall space, or an accessible area to mount your charger, the EV charger pedestal can expand your placement options. 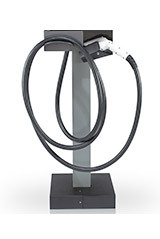 The pedestal is bollard mount compatible, for use with our CS line of EV chargers. Electric Vehicle Only. 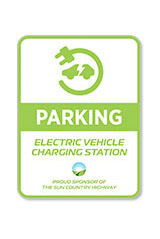 Create a designated electric vehicle parking space for your clients or guests when they need a charge. Quality made white aluminum construction. Dimensions 18” x 24” x 0.063".